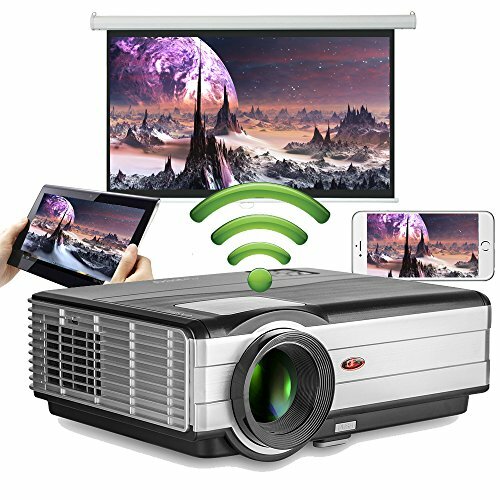 • Built in android4.4.4 OS with wifi, wirelessly connect with PC, laptop, tablet, smartphones to play videos and install apps online; Compatible with streaming media devices. • Built-in high quality 10w speaker, also support external surrounding sound system. • Support Dolby Digital Audio decoding, provide excellent sound effects. • Adopted wide-angle lens, project large size picture at short distance. • It does NOT support Blue-Ray 3D; NOT support bluetooth. • Noise. To extend the life of the projector, we built in 2 fans for better cooling, acceptable noise will be covered by video sound. • Light of Led lamp is relatively soft, ambient light needs controlled properly, not recommended for business & education. Enhanced Performance, Unlimited Entertainment: Featuring Android4.4.4 and Wifi connection, powerful Quad-Core CPU enable smooth web-surfing experience and easy access to an ever-expanding world of music, movies, TV shows,apps, games. Connect to iphone, ipad, android phone, tablet, mac, laptop/pc via wifi. Projection Capability: Adopt wide-angle lens, able to project bigger screen within short distance, no room/space limit. Projection size: 50-200 inch, throw distance: 4.98-18.37FT, widescreen ratio 16:9, support 4:3. WXGA 1280x800 high resolution offers rich details, bright colors, and crisp text, 1080p/i, 720p compatible. Expanded Storage: large 8GB storage enables you to download massive apps from Google Play Store. Plug and play (videos, photos and other files) via USB,support 32GB USB stick and 1TB HDD. Video:3GP, AVI, MKV, FLV, MOV, MP4, MPG, VOB, MPG, RMVB.Audio:MP3, WMA, ASF, OGG, AAC, WAV; Picture: JPEG, JPG, BMP. Advanced Features: Built-in 10W big power speaker, no need to use a speaker (if you prefer, add speaker directly via 3.5mm audio out or via your pc). HDMI input can connect all HDMI-enabled devices: dvd/blueray player, game consoles, pc/laptop, roku, firestick etc. Free 4.8ft HDMI cable is included. Easy To Use: Front/Rear projector, offers ±15° vertical keystone correction, Zoom in and zoom out, 360° Image flip function, can be hung from the ceiling or set on any flat surface, M4 screw holes. fit for general projector mount. 50000 hours LED lamp, removable dustproof net, durable and simple to maintain. Warranty: 1 Year.